The company was born in Eufaula, Alabama in 1971, when in its nascent form the company’s engineers were modifying Heath Kit Depth Sounders in the great spirit of tech hacking to in order to shield them from interference. Word of mouth powered the early sales, and in relatively short order they’d created brand recognition and demand was increasing. By 1975, the company had moved on to create its Super Sixty, the first waterproof depth sounder that cemented the company’s place as a fish finder leader. It seems an obvious product iteration now, but at the time it was huge. 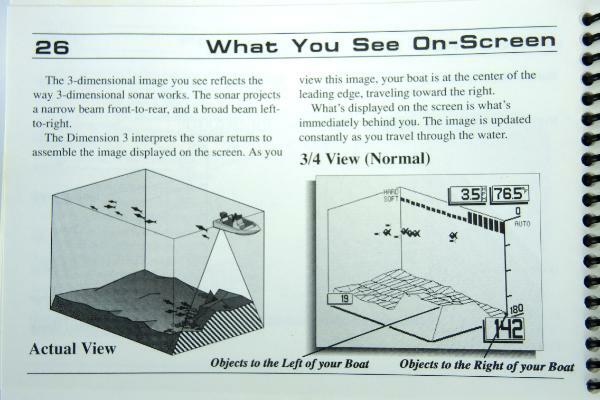 Further tech innovation came in 1984 in the form of the industry’s first LCD fish finder with what they called the LCR series. Beyond just the innovation, the development cycle of the LCR was interesting as well. Instead of going to dealers and shops for feedback, they went straight to the customer. What they found was surprising. Reflecting the mindset of Occam’s Razor and KISS (Keep It Simple, Stupid), the customer wanted greater simplicity, not more complication and features. As a result, the LCR had only two buttons. The LCR, just like the concept of wrapping technology in simplicity, proved to be a success. The company further flexed its innovation muscles in the the early 1990s with the Dimension 3 fish finder series, featuring the first three-dimensional displays in the industry. Dimensional 3 manual image courtesy Melflower.com. After the company’s acquisition by Johnson Outdoors, it’s owner since 2004, Humminbird kept its pioneering reputation with the first consumer-available side-imaging sonar system the following year. Field-of-view innovation continued with the industry’s first 360-degree imaging that came out in 2012. For the first time, anglers could see in all directions around their boats. Credit to Scout.com for its great Humminbird history article. Humminbird has several product offerings meeting the needs of varied anglers. The company’s main product lines include the Helix Series and the Solix Series, with ancillary offerings in the PiranhaMax and Fishin’ Buddy. The Helix series is the company’s heavy hitter, with screen offerings of 5, 7, 9, 10 and 12 inches, with a range of features including down imaging, side imaging, GPS, and networking capabilities. The Solix series is aimed at the high end of the market, with 10-, 12-, and 15-inch screens and only more feature-rich configurations when compared to the Helix line. The PiranhaMax series, with diminutive 4-inch screens and very basic features, meets the entry end of the market for mounted fish finders. The Fishin’ Buddy, with a a quick-release clamp mount and an attached, nacelle-mounted transducer, is a unique offering that meets the needs of small-craft anglers looking to stay mobile.